Editor’s Note: As the web develops new interactive capabilities, and students come armed with social media with audio, graphic and video capabilities, there is renewed opportunity for educational experiences using these familiar media devices. This extension of learning opportunities is challenging teachers to involve themselves with communication cultures well established among students. In the asynchronous online learning environment, integrating innovative teaching strategies that connect, engage, and motivate learners is imperative to create a quality learning experience for both instructors and learners. Asynchronous and synchronous audio feedback and dialogue are emerging tools that can help increase social interaction, foster a sense of community, and create a positive social climate for learners. The introduction of audio and video may enhance communication between instructor and student and lead to better teaching and learning outcomes. The ability to provide more emotive messages within an online course-room may also enliven and enhance student and instructor engagement with the content, increase student participation, and reduce student attrition. YackPack, Centra, and the use of MP3 audio feedback files allow for social networking within the online classroom, and appeal to both visual and auditory learners. This article will provide a general description and overview of YackPack Voice Groups, Centra, and explain how MP3 audio files can be utilized for feedback and communication. Examples of how these learning tools and platforms can be effectively applied and integrated into online courses and pilot data with limitations and challenges of this new technology are also provided. In the asynchronous fast-paced, online environment, it is imperative for educators to integrate dynamic, innovative, and motivating teaching strategies to foster a sense of community and connectedness and a positive social climate among both instructors and students (Lackie & Terrio, 2007). Using a variety of delivery methods appeals to Web 2.0 learners more fast-paced learning style and allows for greater retention of material (Educause, 2005; Ice & Phillips, 2006). Further, utilization of cutting-edge technology provides learners with a comfort level with this medium making the learner more marketable for future employment. Learners are also challenged with increasing their communication skills which is a necessary skill in today’s market. The introduction of audio media in online learning, versus traditional typed responses that are read as text, may enhance communication between the instructor and student and lead to better teaching and learning outcomes. The ability to provide more of the emotive, personal messages within an online course-room may also enliven and enhance student and instructor engagement with the content, increase student participation, and reduce student attrition (Ice & Phillips, 2006). In addition, instructor feedback that may be more time intensive to type can be easily accomplished by providing learners with an audio message. These audio messaging options are easy to use and intuitive for the user, permitting educators to focus on content rather than addressing complex technological issues (Wallen, Burke, Oomen, 2008). The introduction of audio media in online learning, versus traditional typed responses read as text, may enhance communication between the instructor and student, lead to better teaching and learning outcomes, and offer a method of assessing and responding to students’ communication skills. The ability to provide more of the emotive, personal messages within an online course-room may also enliven and enhance student and instructor engagement with the content, increase student participation, and reduce student attrition (Rovai, 2002; Rovai & Lucking, 2000). Asynchronous and Synchronous Audio Communication social networking tools such as YackPack Voice Groups, Centra, and MP3 file sharing provide students with an opportunity to discuss course-related content, debate a topic, discuss research or final course projects, listen to guest speakers (from as far away as another country), ask questions regarding the course or content, collaborate with other classrooms (near or far) or share current issues. In addition, instructor feedback that may be more time intensive to type can be easily accomplished by providing learners with an audio feedback message. Through the use of YackPack Voice Groups, the instructor can provide online students who have differing schedules with the ability to interact with their classmates, instructor, and guests at different times of the day (asynchronously). By implementing Centra, an engaging learning environment can be established despite limitations of location. Instructors can also utilize free or inexpensive software to create MP3 audio files to help provide meaningful context and rich detail for students when offering assessment feedback. Learners seem to perceive audio feedback in a more relevant and meaningful way and value the more personal feedback provided (Merry & Orsmond, 2007; Oomen-Early, Wiginton, Bold, Gallien & Anderson, 2008). What are Centra, YackPack, and MP3 Audio Files? and How Can They Be Used in the Online Classroom? Centra is a user-friendly, interactive, online learning program that combines a highly interactive virtual classroom learning, e-meeting, and web seminar platform with a learning content management system (Centra, 2008). Centra allows faculty and students to participate in a “live” class from anywhere as long as the user has an Internet connection. All classes using Centra are recorded and archived for easy playback by students unable to attend the live sessions or for students who would like to review the session at a pace more suitable to their learning style. The students can see and hear the instructor as well as respond to the instructor and each other in real time. Multiple presenters can participate in a Centra session and use a whiteboard for interactive markup if needed. Surveys can be created and conducted through the use of Centra sessions. Through an application sharing tool, the session presenter can share any Windows application with class participants for demonstration or presentation purposes. The instructor can also provide guidance while using the Web and allow for all students to see a website, or focus on a particular feature of a website, because all students will see what is on the instructor’s screen as he/she navigates through the Web while giving audio and/or video feedback. The instructor can offer auto-graded quizzes or personalized evaluations online. Breakout rooms and labs are also available so the instructor can break larger groups into smaller discussion or work groups and monitor their progress. There is a cost for the host of Centra sessions, which varies based on the type of institution offering the platform and the number of participants; however, there is no cost to the users. Centra Client will automatically download to participants’ computers the first time they log onto the Centra Server. The following web address offers an overview of Centra capabilities and a demonstration of student and instructor interactions: http://www.saba.com/products/centra/centra_demo/index.html. YackPack is a web-based asynchronous audio communication tool. YackPack provides the instructor with the ability to develop audio-based asynchronous communications activities for the course through the use of audio messages and instant text messages; however, it can also be used to relay real time information to participants online and logged in. An email message is sent to each student in the course whenever an audio message is posted in the section of the YackPack AAC system that has been set up for the course. YackPack creates a comfortable learning space for language learners and for those appreciate time to think and create personal responses to questions, comments or opinions offered by others. Creative supplements such as adding a photo also provides the user with a greater sense of connectedness. 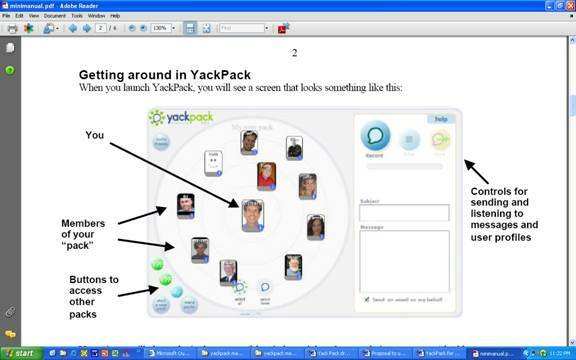 See Figure 1 for a quick guide on how to use YackPack in the online course room (YackPack, 2007). On the log in screen, type your email address and password. Note that educators should use their university email address to manage the course and to ensure the students recognize the email address provided. To send a message, click on the members name or picture (you can click on multiple names/pictures for messages to a group of members). The talk box on the side right side of the screen provides functions for recording and sending messages to others in your group. Click on the record button to begin recording your message. Once finished, click on the “send” button. To listen to a message sent to you, click on the grey bar under the member’s name/picture. To retrieve information about the user, click on the “I” button located to the right of the member’s name or picture. Once you are a member of YackPack, you can then create new “packs” based on your needs. An instructor may want to have various packs for their course sections or based on content or material related to the curriculum. Educators can also set up separate user groups for “study groups” or final group projects. YackPack access has been free in the past; however, small fees may now apply. It can be accessed anywhere with an Internet connection and does not require any software or server installation. Several free or low-cost software packages are available, which allow instructors to use an internal or external computer microphone to record or convert previously recorded files into MP3 audio files for students. These files may be emailed to students or posted on a student’s assignment site within online course platforms such as WebCT or Blackboard. The tone and inflection used when providing audio feedback removes the barriers associated with understanding the intent of the instructor’s written notes and clarifies suggestions for improvement vs. explicit feedback for required change. More detail is often provided when speaking than writing and examples are more easily relayed to students verbally as opposed to written text notes. In addition, further emphasis can be made to highlight important content and introduce brief supplemental material. At time of press, YackPack was free of charge for users. However, a small charge of $5 per user per month may be implemented in the near future. The researchers contacted the owner of YackPack, Dr. B.J. Fogg. at Stanford University, who has created an in-kind user rate for educators. Cost can be an issue and varies with the type of client and number of users of Centra. Because Centra is synchronous, schedule conflicts may occur. However, Centra is equipped with a playback feature for later viewing. Students may have to purchase a headset with a microphone for both platforms if their PC system is not equipped with a microphone. The charge for a headset is quite reasonable and should be considered with the cost of course materials. Some believe innovative audio social networking tools are just a “fad” and have no real value in the academic learning environment (Lackie & Terrio, 2007). As an educator, you may be in the role of advocating for the benefits of using a supplemental teaching strategy such as YackPack or Centra. Intellectual property and FERPA are areas of concern for higher education, so it is important for instructors and staff to consider any ethical and legal issues that may hinder the use of these platforms at their institution (Educause, 2006). There are fewer limitations associated with using MP3 audio files. Depending on the length of the recording, the files may be quite large and require lengthy downloading depending on the user’s browser and Internet connection. Some students prefer visual and auditory feedback, so finding a solution to incorporate both is worth investigating in the future. Figure 3. Screenshot of Centra. A pilot study was conducted to explore the perceptions and use of YackPack, Centra, and MP3 audio feedback files among students enrolled in online health education courses. An online survey was utilized by the researchers during Fall of 2007 and Spring of 2008 using a non-randomized convenience sample of students at a large university in the southeastern U.S. A 14-item survey instrument was developed to collect the study data, based on other instrumentation reported in the relevant literature that has been used to assess online technology usage. In addition to items on YackPack, Centra, and MP3 audio feedback file usage and perceptions, demographic items on gender and class standing were included. Face and content validity for the instrument were established by two researchers with expertise in health education and online instructional technology. In the Fall of 2007 and Spring of 2008, the survey instrument was posted on a survey data collection website (SurveyMonkey), and an email was sent to 54 learners enrolled in three online graduate health education courses. Anonymity and confidentiality of survey participants were maintained on the survey website through the use of Secure Socket Layer (SSL) encryption of the data and by not collecting any unique personal identifiers in the survey. Students received minimal extra credit as an incentive for completing the questionnaires. ¨ Divide courses with large numbers of students into smaller, 6-7 people “YackPacks" to make the class more personable and connected. ¨ Go from lecture to small discussion by extending the conversation from in class lectures into small virtual YackPacks with an online course supplement. ¨ Host a guest speaker YackPack session on related content where students can leave messages for the guest speaker to reply to. ¨ YackPack also has text-based capabilities that could accompany audio messages for those who may be hearing impaired. ¨ Conduct audio "Q&A" sessions during online office hours, where students can join the Q&A YackPack and ask questions regarding that week’s content. Figure 4. Teaching Ideas for Using YackPack (Via an Online Course). A total of 14 out of the 20 students who received the study invitation emails completed the survey, for a 70% response rate. Of the total respondents, 7 were male and 7 were female. One student was a sophomore, two were juniors, four were seniors and seven were graduate students. Seventy percent (n = 10) moderately agreed that they enjoyed using YackPack as a discussion tool. Two felt that they strongly agreed they enjoyed using YackPack and only two moderately disagreed they enjoyed using YackPack. Ten respondents strongly or moderately felt it was easy to use (69.6%). Close to 80% (n = 11) of learners listened to their audio messages from their fellow learners and half (n = 7) felt comfortable creating audio messages. All learners agreed that YackPack could be a very helpful communication tool for students and the instructor in online courses. Interestingly, only 36% of students agreed that they would prefer using audio discussion boards rather than written discussion boards with their peers. The findings were similar with respect to audio messages saving time. Eighty percent of respondents felt that using YackPack could help them understand course content better than without having it as part of the class. And lastly, 100% of learners felt that YackPack helped improve student peer and instructor interaction in the virtual classroom. ¨ Host a guest speaker from another location or country, which can be used live or saved and used for future classes with the playback feature. ¨ Have a debate between two groups within an online class. ¨ Hold question and answer sessions to review a new concept. ¨ Have students present projects, presentations, or papers to the entire class or in small groups using the breakout rooms. ¨ Have students work in small groups to critique an article, text excerpt, or analyze a case study. ¨ Use the white board to teach new statistical formulas or use the applications share tool to have students apply new methods for solving problems with real time feedback. ¨ Conduct portfolio and peer review sessions. ¨ Use the web cam video panel feature to have students teach a class or practice a new pedagogy method with real time participation and feedback (the playback feature will also allow the guest teacher to analyze his/her performance as well). ¨ Present new material through the use of PowerPoint, Word, Excel, or video and/or the Internet. 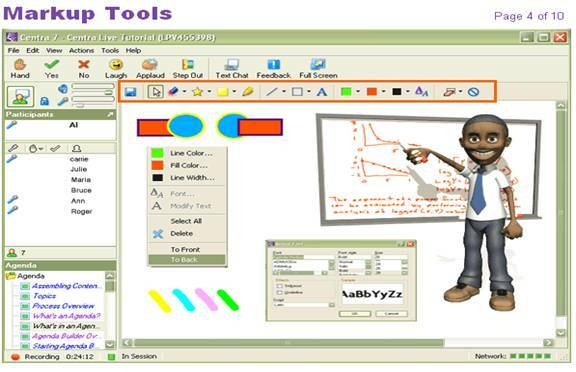 ¨ Use the web cam feature to demonstrate kinesthetic movement, first aid techniques, conduct experiments in real time, and to provide any other instruction which requires viewing an active demonstration. The web cam feature can also be used by the students for the instructor to watch their application of the skills taught. The instructor can offer real time feedback during the assessment/practice session. ¨ Conduct an online focus group to explore a research question. ¨ Conduct online tutorials or provided guided instruction using a new technology tool, website, or program. ¨ Link learners from two different courses to interact or explore a learning issue. ¨ Use Centra as a voice over recording tool for your PowerPoint presentations to be saved and viewed at another time. Twelve out of eighteen students enrolled in a graduate health education course completed an initial questionnaire regarding their perceptions of Centra as an additional tool in their online course, for a 66% response rate. Seventy three percent of the students (n = 8) were female with 33% (n=4) male. Fifty percent of students always used the playback recording feature when not able to attend a Centra session, while 42% used it occasionally. Ninety-two percent of respondents (n = 11) moderately to strongly agreed Centra was user friendly and easy to use. The majority of students (n = 11) felt that users at least needed a small level to a moderate level of technical experience to use Centra. Most students (n = 11) felt that they enjoyed the Centra sessions hosted by the instructor and 100% (n = 12) agreed that the session enhances their understanding of the course content. I enjoyed the personal contact, the ability to ask questions and hear other students ask questions and receive immediate feedback. The use of documents and presentations were very helpful. The one session I missed was due to my own failure of not reading an email. I will go back and review the recording. I was very impressed the first time I used Centra. I thought it was a great way to connect with the professor and classmates. I think it is a great tool for distance learning because it allows interaction that is typically unavailable. At first, I was a little nervous of Centra…but after the initial class, I can’t imagine the class without it. I appreciate the ability to playback the session, it was quite helpful. I believe that without the Centra sessions, I would not have been as successful as I have been. I hope my classes in the future will access this capability. The audio messages are very informative and creative. It creates a feeling of person to person contact with the instructor on a weekly basis. I enjoyed having the resource of the audio messages. I think they (the audio messages) are helpful to connect with the instructor but they should not be the only method of communication for information… they should be another option to learn what’s necessary. They (the audio messages) helped me understand the material. The audio messages made this course feel just like a traditional classroom course. I would recommend audio messages for all online courses. It should be noted that these instruments were created by the researchers and reliability was not established. The purpose of the surveys was to gain insight into students’ perceptions of these integrated online platforms. Because of the small sample size, inferential statistics were not applied. The results are not generalizable beyond the current population sampled. The research literature related to developing and evaluating the effectiveness of communities, particularly online communities consistently support the need for classroom components such as support, cooperation, commitment, and interaction. Researchers report evidence of a significant relationship between classroom community and perceived cognitive learning (Rovai, 2002; Rovai & Lucking, 2000). Full time distance education students report that the interaction links between students in an online course help to overcome feelings of isolation and provide affective support (Anderson, 2004). Through the use small group discussions and other teaching activities that promote collaboration, Weigel (2001) shares, “social presence, cognitive presence, and teaching presence coalesce and deep learning takes place” (p.5-6). Asynchronous and synchronous messaging in online instruction is an important and growing medium which instructors can build social presence and foster a sense of online community. This pilot data, though small, provides initial insight into the effectiveness of these platforms. Anderson, B. (2004) Dimensions of learning and support in an online community. Open Learning,19, 183-190. Ice, P., Phillips, P. & Wells, J. (2006, Nov.) Asynchronous Audio Feedback: Enhancing Teaching Presence and Students’ Sense of Community. Paper presented at the Annual Sloan-C Conference on E-Learning, Orlando, FL. Lackie, R. J., Terrio, R.D. (2007). MASHUPS and other new or improved collaborative social software tools. MultiMedia & Internet@Schools, 14 , 12-16. Merry, S. & Orsmond, P. (2007). Students responses to academic feedback provided via mp3 audio files. The Science Learning and Technology Conference. Oomen-Early, J., Gallien, T., & Gould, A. Using Asynchronous Audio Feedback in Online Health Education Courses: A Pilot Study. Unpublished research article, Texas Woman’s University. Oomen-Early, J., Bold, M., Wiginton, K.L, Gallien, T., and Anderson, N. (2008). Using Asynchronous Audio Communication (AAC) in the Online Classroom: A Comparative Study. Journal of Online Learning and Teaching, vol. 4, (3). Rovai, A.P. & Lucking, R.A. (2000). Building sense of community at a distance. The International Review in Open and Distance Learning, 3(1). Rovai, A.P. (2002) Sense of community, perceived cognitive learning, and persistence in asynchronous learning networks. Internet and Higher Education, 5, 319-332. Sethi, R. (2007). PBwiki announces voice chat--and it is awesome. The Daily Peanut blog. Retrieved September 18 at (blog.pbwiki.com/2007/04/11/pbwiki-announces-voice-chat-and-it-is-awesome). Wallen, M., Burke, S., Oomen J. (2008). Using group audio communication to enhance social connectedness in the online health education classroom. Online Classroom, June, 2008. Weigel, V.B. (2001). Deep Learning for a digital age: technology’s untapped potential to enrich higher education. San Fransico: Jossey Bass. Michele Wallen Ph.D. is an assistant professor in the Department of Health Education and Promotion at East Carolina University. She began her professional career working as a teacher in NC public high schools. Prior to joining the faculty at East Carolina University, she worked as a health education consultant for the NC Department of Public Instruction. Michele earned her BA at the University of NC at Chapel Hill and her MPH and PhD at the University of NC at Greensboro. She currently teaches in the undergraduate and graduate school health education programs and focuses her research on curriculum integration, body image development and perceptions, and adolescent and young adult utilization of technology in communication and relationships. She currently serves as a member of the Health Division School Health Council for the Southern District American Alliance for Health, Physical Education, Recreation, and Dance and a past-president of the North Carolina Association for the Advancement of Health Education. Sloane C. Burke Ph.D. is an Assistant Professor in the Department of Health Education and Promotion at East Carolina University. Dr. Burke has over 10 years of experience in course development, curriculum design, assessment, accreditation, and university instruction, and has taught various (over 20) undergraduate- and graduate-level public health courses, both in class and online. Dr. Burke has 11 years experience in course development, curriculum design, assessment, accreditation, and university instruction using a variety of platforms and instructional design methods. She has research publications on implementing innovative technology in the online classroom environment. Dr. Burke holds a Ph.D. in Health Studies with a concentration in Community Health and an MS in Health Promotion, and is a Certified Health Education Specialist. She has been an active member of the American Public Health Association (APHA), American Association for Health Education (AAHE), and the Society for Public Health Education (SOPHE). Jody Early-Oomen Ph.D. is an Assistant Professor and former director of online programs in the Department of Health Studies at Texas Woman's University. Dr. Oomen-Early's research has focused on strategies to increase student engagement and social presence in the online classroom as well as factors that promote and hinder effective online instruction. Dr. Early is currently exploring the impact of technology on underdeveloped countries, such as Sierra Leone, in relation to maternal and child health. Dr. Early is also a Certified Health Education Specialist and is active in professional organizations relating to E-learning and health.